Classmates find that they can lean on each other. Friends gather for events throughout the year, including the Women in Medicine Pink Run. St. George’s University is not only a center for global education but also where students from all corners of the world, from all walks of life, come together for a common cause – to make an impact on the community, whether it’s health care, veterinary medicine, business, or another chosen field. SGU and the island offer an array of enriching extracurricular activities that strengthen the bond between students. In its history, SGU has welcomed students from more than 140 countries, creating a campus that provides an international education even outside the classroom. Their cultural immersion begins during Orientation Week with the popular Bazaar, which allows students to sample food available at local restaurants, and to watch Grenadian cultural performances. In addition, they can find out about and meet representatives of our more than 50 student organizations, which capture all aspects of student life: cultural, religious, social, academic, professional, and community service. For families, the Significant Others Organization (SOO) is comprised of spouses and significant others of students and faculty who have relocated to attend SGU. Its mission is to facilitate the transition of the significant others and their families to Grenada, to provide social and recreational activities for significant others and their families, to act as an informal support group for significant others and their families, and to participate in and organize philanthropic activities for the Grenadian community. Each spring and fall, families are also welcome to visit Grenada for Beyond Spice Family Weekend. 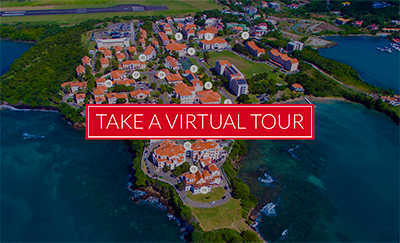 Our guests can expect a full schedule of events designed to give them a glimpse of what life is like as a student at St. George’s University, including campus and island tours, cultural extravaganzas, and more. In addition, families of first-term medical and veterinary medical students can witness the White Coat Ceremonies, their loved one’s official entry into their chosen profession.